Brand loyalty in traditional cigarettes with Canadian brands such as Players, DuMaurier, Export A, Players, Belmont and Matinee have long been established with smokers through powerful marketing strategies that are now more regulated than they were in the past. There are e-juice companies such as Premium Labs in British Columbia, Canada that have successfully simulated many popular flavors to match your favorite brand. This is no accident, they are capitalizing on the brand loyalty that many long time smokers have. And I say, if it makes it easier for you to switch…..then BRAVO! I have no scientific facts on this one, but based on my personal experience working at a vape shop in Toronto, Ontario, smokers who have smoked more than 20 years often choose a tobacco flavor profile that closely matches their existing habit. Answer…..KIND OF…..but you should know that the rate of success for long time smokers seems higher when they start with tobacco flavors. Think about trying to have someone who has smoked for Players for 40 years, vape something called Dohz Nutz, which is made to taste like Salted Caramel Glazed Cinnamon Sugar Donut with Candy Roasted Peanuts! NOT GONNA HAPPEN! It’s interesting to note that in Canada, the government has allowed the removal of the nicotine levels on cigarette packs. Ya, go ahead and check…..I’ll wait…..UNBELIEVABLE RIGHT? Don’t worry, we are more clever than Big Tobacco and their government partner! DON’T GET ME STARTED or I’ll have to tell you the federal and provincial government gets $8 billion a year from tobacco sales tax! Anyhew….when choosing your nicotine strength in an ecigarette, you need to first consider your current smoking habits. Your local vape shop in Canada can also help you choose the strength that is right for you. Your goal should be to strike a balance between ensuring you are intaking enough nicotine to satisfy your cravings and not choosing a nicotine level too high which will cause your throat to hurt. If you have been smoking between 15-20+ years, you may want to consider the fact you are very comfortable with the taste, type of tobacco and nicotine intake that you get on a daily basis. If you are an inexperienced smoker than you may want to consider that your body is probably going to be less adjusted to the type of cigarettes, which may help you to consider changing the flavor to something more appealing, like fruits or desserts. WHAT THE HECK IS Mouth to lung vs. Direct to lung? Another factor that contributes to the nicotine level best suited for you is the way you will be inhaling your vapor. Long term cigarette smokers may be more comfortable with the mouth to lung inhale, which is a consecutive double inhale. This is when you first take a slow draw into your mouth and then inhale the vapor into your lungs. Cigarette smokers who are not as accustomed to cigarette type-inhaling, and who may also smoke joints or hookahs, may be more comfortable with a direct lung inhale. This is when you don’t hold the vapor in your mouth, but just inhale directly into your lungs. Mouth to lung inhaling is best suited to pen style ecigarettes, and is ideal at lower temperatures. Due to the fact that the power in your e-cig directly correlates with the amount of vapor, and therefore the strength of the hit, a mouth to lung device is best suited for higher levels of nicotine. Someone who has a direct to lung e-cig and is running it at a higher temperature would not likely be able to handle 18 or 24mg of nicotine in their ecigarette because the throat hit would be too intense. 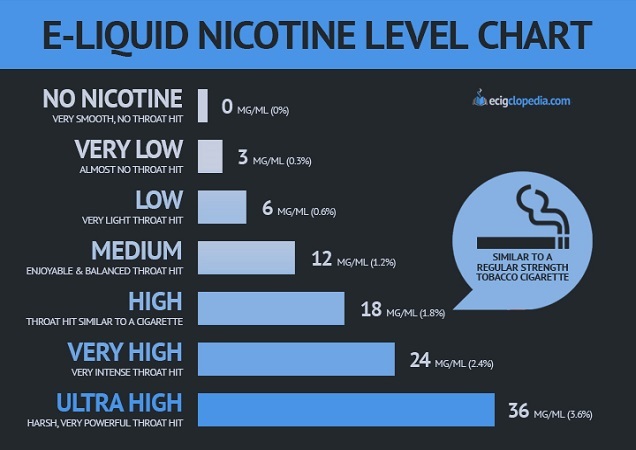 However, someone running any ecigarette that operates in voltage rather than watt mode, and is inhaling using a MTL technique, may need to increase their nicotine to keep your cravings satisfied. If you are more comfortable with a direct to lung inhale, then you will be best suited to an ecigarette that runs at higher temperatures. This factor is important to consider because typically tanks that are direct to lung run at temperatures that range from 20W+, up to 230W. Particularly at the higher temperatures, above 75W, the nicotine levels that are probably most appropriate would be either 3mg, 6mg, or 12mg of nicotine; although 12mg may likely be too strong. DOES THE TYPE OF ECIGARETTE IMPACT NICOTINE LEVELS? There is a direct relationship between the power of your device and your throat hit. In very simple terms you can think of the relationship as outlined below. Note that both can be satisfying. Another concept to consider is whether you are using a rechargeable or a disposable e-cig. This factor also has a direct correlation to temperature, as a rechargeable e-cig will run at a higher temperature than a disposable e-cig. Therefore, if you are using a disposable ecigarette, you should investigate using the highest nicotine level. Even a Vaper who uses an ecigarette at 100W, and is used to 3mg, would not find much satisfaction in a 3mg disposable cigarette, and may consider going as high as even 24mg of nicotine in their disposable ecigarette. WHAT IS YOUR IDEAL GOAL? Whether you are choosing to move from cigarettes to an ecigarette in Canada, and whether this is a new year’s resolution, or something you have been battling with for years, you must have some sort of ideal outcome in mind. If you are planning to quit smoking completely, than the nicotine strength in your ecigarette liquid is very important. There is a wide range of nicotine levels available in ecigarettes ranging from 0-36mg, with 3-18mg being the most commonly used. The e-liquid milligram level on the e-liquid bottles, is the amount of nicotine per ml of e liquid. So if you are using an ejuice between 12mg-18mg, which is the closest nicotine level to a regular cigarette. Regular cigarettes are typically 11-15 mg of nicotine, and a tank will last a various amount of time depending on the type of draw (mouth to lung vs direct to lung), the type of ecigarette you have and how often you are vaping. E-liquid is available in 0mg, which is ideal for those with no previous smoking experience who want to get into the world of ecigarettes in Canada. For occasional smokers (between 0-10 cigarettes a day) the best nicotine strength would be 3mg-6mg, which is almost no throat hit, or a light throat hit. For smokers who smoke between 10-20 cigarettes a day, they may be best suited at 12mg of nicotine in their e-liquid. 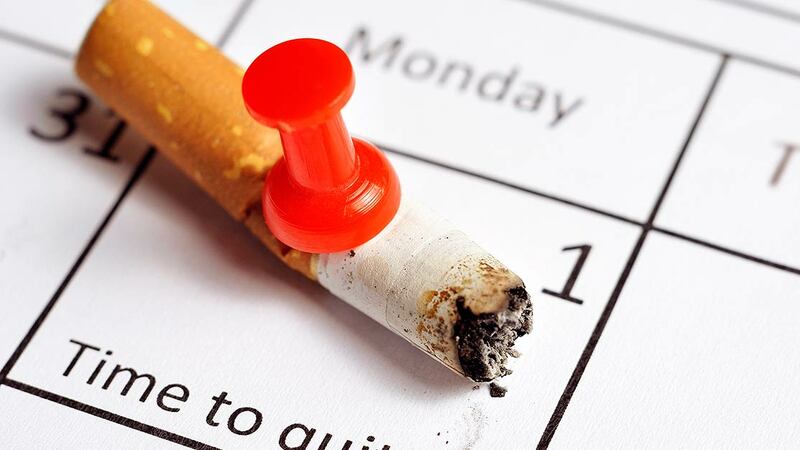 Finally, for smokers who smoke 20+ cigarettes a day or more, they should consider 18mg, 24mg or 36mg of nicotine. Again, noting you type of device may alter the nicotine levels. If you are unsure of which level of nicotine would be most suited to you, it would be in your best interest to visit a vape shop in Toronto to ask any questions you might have about ecigarettes in Canada. IS CHOOSING MY NICOTINE STRENGTH IMPORTANT? Simple answer…..YES, very important “IF” you want to quit. When using ecigarettes to quit smoking, it is very important that you choose the right level of nicotine. If your level is too high or too low, then you will not be able to quit efficiently. If your nicotine level is too low you will most likely end up smoking cigarettes to compensate for the lack of nicotine that your body is used to having on a regular basis. This will cause you to think the ecigarette does not work for you, and most likely turn to the easier option which is going out and buying a pack of cigarettes. If your nicotine level is too high it will end up being too strong for you, and this can cause a range of side effects including nausea, sore throat, headache or dizziness/light-headedness. If your nicotine is too high, you will end up developing a distaste for ecigarettes and may not be successful in helping you quit smoking. If your nicotine level is just right you will experience a relaxing sensation of being thoroughly and completely satisfied with you ecigarette, which will make quitting smoking easy and fulfilling. All this information may have left you feeling relatively overwhelmed, and unsure about which level of nicotine would be best suited for you. If this is the case, your best bet would be to find a vape shop in Toronto, or nearest to you, and head in to get all of your ecigarette questions answered! The pros have answered these questions on a daily basis, and with some information, and some trial/error, they will help you to identify the best nicotine level for you. When you find the best set up for you, you will be more than satisfied and more motivated to quit cigarettes than ever!